With simple integration, barcodes can be easily scanned and decoded in your .NET projects from images, like JPG, JPEG, PNG, TIFF, BMP, and GIF. This article will guide you to integrate CnetSDK .NET Barcode Scanner Library DLL into Visual Studio .NET project and tell you how to use barcode scanner in C#. Barcode Scanner C# sample codes for .NET 1D & 2D bar codes recognition and decoding are provided. 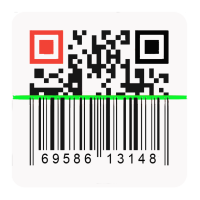 You can choose suitable .NET barcode scanner APIs to read and scan barcodes from a loaded image source. We provide free .NET Barcode Scanner SDK trial package for your evaluation. Please firstly download .NET Barcode Scanner online. In the download package, you will find CnetSDK.Barcode.Scanner.Trial.dll. To integrate this barcode scanner library to your Visual C# .NET project. you can simply add CnetSDK.Barcode.Scanner.Trial.dll into your C#.NET project reference. Please note, the first data value of each barcode will be decoded as CnetSDK* if you are using our free trial package. Our .NET barcode scanner library allows you to load three image source to your C# .NET barcode scanning application, which are String, Stream (memory stream), and Bitmap Object. If you want to read and recognize barcodes from PDF file page, please use our .NET PDF barcode reader library. // Scan all 1D & 2D barcodes from Stream object. // Scan all 1D & 2D barcodes from image file on the disk. // Decode a certain type of barcode from Stream. // Decode a certain type of barcode from local image file. // Scan the only barcode from Bitmap. It improves barcode reading accuracy. // Scan the only barcode from Stream. It improves barcode reading accuracy. // Scan the only barcode from a local image file. It improves barcode recognition accuracy. In this section, you will see three pieces of .NET Barcode Scanner C# sample codes for reading and scanning linear/1D & matrix/2D barcodes in your .NET project. You can refer to the first C# sample code to scan, decode and read all barcodes from your image source, linear, 2D, or both. Also, please refer to the second C# sample code to define a certain barcode type to read and recognize. The last C# example illustrates how to read and decode the only barcode from an image and this .NET method will improve the accuracy of barcode reading. If you are in need of .NET Barcode Scanenr VB.NET code demo, please refer to How to Scan and Read Barcodes from Image Using VB.NET Code. More related search teams for C# barcode scanner library: barcode reader c#, barcode recognition c#, .net barcode scanner library, .net barcode recognition c#, .net barcode scanner api, .net barcode scanner example c#, .net barcode reader component, .net barcode reader library, .net barcode reader free, c# barcode recognition sdk, .net barcode reader dll, barcode recognition using image processing, c# barcode recognition software, barcode decoder from image, barcode decoder app, barcode decoder algorithm c#, barcode recognition .net open source c#, .net barcode recognition decoder sdk, and .net barcode reader code c#.